Regardless of the industry or the profession, it’s human nature for employees to want someone at work to care about their well-being, and to be invested in how they’re doing. The need for that sense of connection, or a listening ear, is especially relevant when we’re at a new job, or working for a new company. Navigating a new organization and connecting with a new manager can be a welcome change – but it can also be difficult. It was through his discussions with trucking companies that Rim Yurkus, founder of Strategic Programs, Inc., identified the need for conducting new driver check-ins.These check-ins are part of a strategic contact initiative, in which a company works with a third party to contact drivers at strategic points in the employee lifecycle to gather insights and information about their experience. If these pain points aren’t addressed within the first few months of an driver’s hire, they can lead to low morale, unproductive drivers, and high rates of turnover. Proactively addressing those pain points is how strategic contact comes into play. These strategically timed check-ins are designed to answer driver questions, build relationships, and gather retention data during the first six months of the employee life cycle. Ideally, new drivers would have these conversations with their new manager. Unfortunately, they may not feel comfortable bringing up problems or issues in the first few months after they’ve been hired. Or, the manager may not be a skilled communicator. That’s when unresolved issues and unanswered new driver questions become larger problems. If they’re not going to talk with a manager, who can a new driver talk to about an issue? Strategic Programs has found that a third party “retention agent”, who maintains contact with a new driver over the course of six months, is critical for a strategic contact program’s success. The retention agent serves as an impartial, confidential, and dedicated contact for the new driver. Strategic contact helps trucking companies retain new drivers by providing a dedicated contact with whom the driver can connect during those critical points in the employee lifecycle – points when the driver is deciding whether or not to stay with the company. Connecting with employees at these times provides a baseline of quantitative data based on responses to standard survey questions, as well as qualitative data based on personal comments and feedback from drivers. Let’s consider what strategic contact might look like in the first few months of hire for a new driver. Month 1: This is when the retention agent can ask if the driver has any questions about the company, confirm that he or she feels welcome in the organization, and received necessary orientation materials. The driver feels welcomed, establishes a personal connection, can bring up any unanswered questions, and understands that he or she is indeed more than a number in the eyes of the company. In addition, positive or negative themes about the onboarding and orientation experience may be identified and addressed. Month 2: By the second month, the new driver will have received at least a few paychecks. This is an opportunity for the retention agent to address a common pain point by confirming that the payroll process is working and the driver is receiving accurate and timely pay. Strategic contact outcomes: If there are issues, the driver can provide feedback about the payroll process which the company can use to make adjustments as needed. By the second conversation, the retention agent and the driver are starting to build a rapport which is invaluable in terms of increasing driver engagement. Month 3: At this point, the driver is more acclimated to the new work environment. In addition to the standard survey questions, a check-in might involve questions or a discussion about the driver’s manager, whether or not the driver is content with the workload, and overall job satisfaction. Strategic contact outcomes: By the third month the driver and the retention agent have built, in most cases, a working relationship. The driver may feel comfortable enough to openly share any frustrations. The simple act of blowing off that steam can make a huge difference in terms of driver satisfaction. At the core of a strategic contact program is the value of establishing an immediate and trusted connection with a new hire. Waiting too long to have strategic contact, or making infrequent contact, won’t help trucking companies prevent turnover. 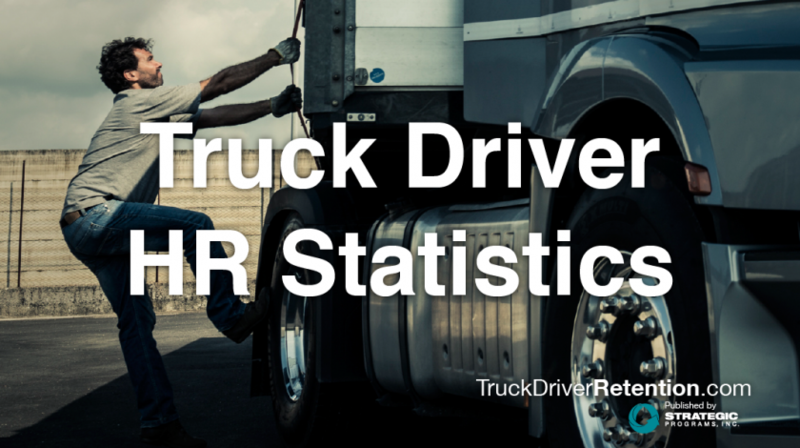 It’s consistent, strategic contact within the first six months after hire that helps prevent drivers from quitting. When drivers have strategic contact with a third-party retention agent, they build a relationship through which they communicate about life, about work, and about what they’re experiencing as new drivers. As part of the strategic contact, new drivers also answer standard survey questions. The responses to these questions inform and identify organizational trends, but they also help drivers keep the bigger picture in mind. In their conversation with the retention agent, a driver may be focused on an issue he or she is having at work. However, after discussing the issue and answering the general survey questions, drivers often realize that the job isn’t all that bad. Sure, there was that (now seemingly minor) scheduling issue, but after answering the survey questions, the driver may be reminded that compensation, equipment quality, and communications are meeting – or exceeding – the driver’s expectations. Bottom line: strategic contact demonstrates that your company cares about the well-being of your drivers. The check-in serves to create a sense of connection, address pain points, and provide a listening ear just when it’s need most. But drivers aren’t the only ones who benefit from strategic contact. With talent shortages rising each year, strategic contact programs are quickly becoming a key differentiator for companies that want to retain their drivers. Through strategic contact, companies obtain valuable, actionable data about new driver pain points and potential retention risks. One strategic contact might just save you from losing a new hire, and that’s a pain point we all want to avoid.